‘No retreat, no surrender’ were the cries of Acting General Secretary of the Guyana Trades Union Congress, Norris Witter; General Secretary of the Caribbean Congress of Labour, Lincoln Lewis; and former treason accused Mark Benschop; yesterday when they were released from the Brickdam lockups. The trio was arrested following a peaceful picketing exercise outside the office of the Commissioner of Police. There were released on $10,000 bail each having had their bail reduced from $50,000 to $25,000 before being further lowered yesterday. Accompanied by their lawyer, Khemraj Ramjattan, and TUC President Gillian Burton, the men walked out of the Brickdam lockups to join some of their supporters outside of the police station. These supporters had gone there since the night before to mount a vigil. Speaking with the media outside the Brickdam Police Station, Lincoln Lewis said that he is contemplating the possibility of building a case to address the issue of human rights at the Organisation of American States (OAS) level. He said that he will be exploring this avenue with his lawyer because of the deplorable state of the Brickdam lockups. Recalling the condition inside the lockups, where they were detained for the night, Lewis said that there are persons of unsound mind, illegal immigrants and sick people there. He said that the lockups have no beds, no toilet facility, and no ablution area. What is inhumane is that persons are being fed in a plastic bucket, he said. “This is the same bucket that they wash in, use to bathe; the tea comes in it with some hard bread and the food comes in the bucket…Men got to take cardboard (to dish out) their food out and eat with card board…That is the condition of the lockups that this country can boast about,” Lewis said. Recalling that Minister Clement Rohee had said that the detention centres are not ‘five star hotels’, Lewis lashed back yesterday when he hit back at President Bharrat Jagdeo noting that Guyana does not even treat its citizens humanly. 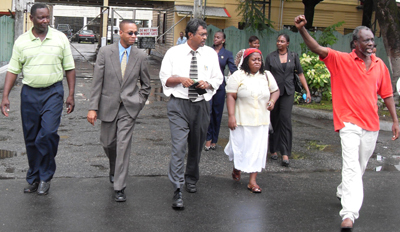 (from left) Lincoln Lewis, Mark Benschop, Attorney- at-law, Khemraj Ramjattan, Gillian Burton and Norris Witter as they walk out Brickdam Police Station. “Mr. Jagdeo was calling on the Caricom Heads of Government to treat Caricom citizens in a serious way…if he can’t treat his own citizens here like humans…do you expect them to remain here?” he asked. He said that the ‘three musketeers’ label that the Commissioner of Police, Henry Greene, applied to them yesterday was duly noted. “There were five of us outside the Commissioner’s office but they came specially to target three of us. Their whole intention is to silence us.” “We shall not be silenced.” He noted that the Commissioner had hinted to the fact that when protests are ongoing guns may ‘accidentally’ be fired. “Let them kill me…let us understand that that is a part of life…When you die, you die for a cause…when you get hit by a car or minibus, there is no cause there…I prefer to die for the cause,” Lewis yesterday said. Allegations flew wild yesterday when Benschop called for the United States to further expose ‘people like Henry Greene’ and reported linkage to the ‘phantom squad/killing squad’ in Guyana. The police are at this time seeking the advice of the Director of Public Prosecution with regards to charges that could be laid against the men. A peaceful picketing exercise outside the office of the Commissioner of Police ended abruptly with the arrests of the trio on Wednesday. The men was whisked to the Brickdam Police Station shortly before midday. Benschop, Lewis and Witter were part of a five-member demonstration, which included former Chief Magistrate Juliet Holder-Allen and Canadian Immigration Consultant, Balwant Persaud. The police stated late Wednesday evening that the men were arrested for illegal picketing, disorderly behaviour, resisting arrest and assaulting peace officer.